It's Meatless Monday, what are you having for dinner?! This recipe is the vegan version of a New Orleans fave. Ok meat lovers, do not be afraid...you too can enjoy this dish! In a Dutch oven, melt butter over medium heat and sauté onion, peppers and celery. After 5 minutes add sage, red pepper flakes, bay leaves, garlic and tomatoes. Add Worcestershire sauce and stir in red beans. Combine well. Remove bay leaves before serving! Looks good!This could definitely work for me. Where do you purchase vegan butter? My doc just told me that my cholesterol is elevated due to my thyroid condition. I've decided to have meatless Mondays and fish on Wednesdays and Fridays. This recipe I will have to try since I'm eliminating things out of my diet. Goodbye chicken wing recipe and I was going to make it tomorrow, LOL. You can always do the chicken recipe another day! 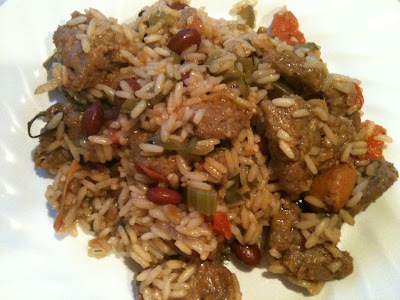 This vegan version of Jambalaya was very tasty even without the vegan protein. Let me know how it turns out for you when you do it! I have a lentil burger recipe that I'll be sharing in the next few days too. I forgot to tell you I made the Vegan Jambalaya Monday for my nephew's birthday and everyone loved it. I told them afterwards it was meatless LOL. LOL.. good one! Glad you and the family enjoyed it! I do agree with all of the concepts you've presented to your post. Thank you for the comment. I'll see what I can do on the next one!